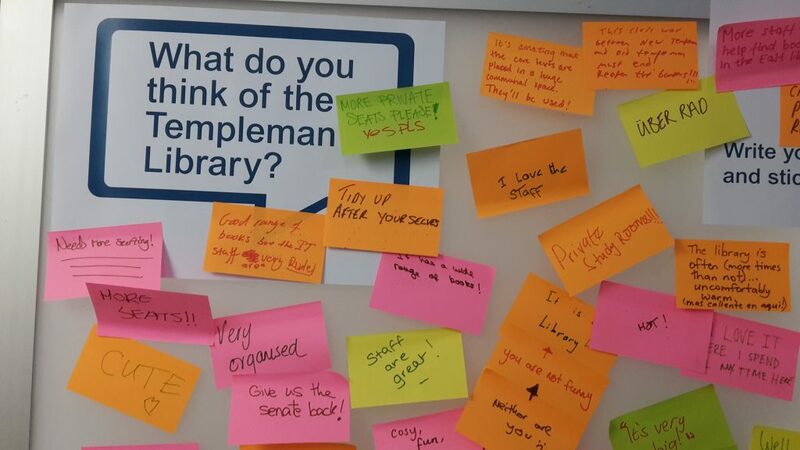 In Welcome Week (19-23 September), we piloted gathering feedback in the form of post-it notes on walls in the Templeman Library. 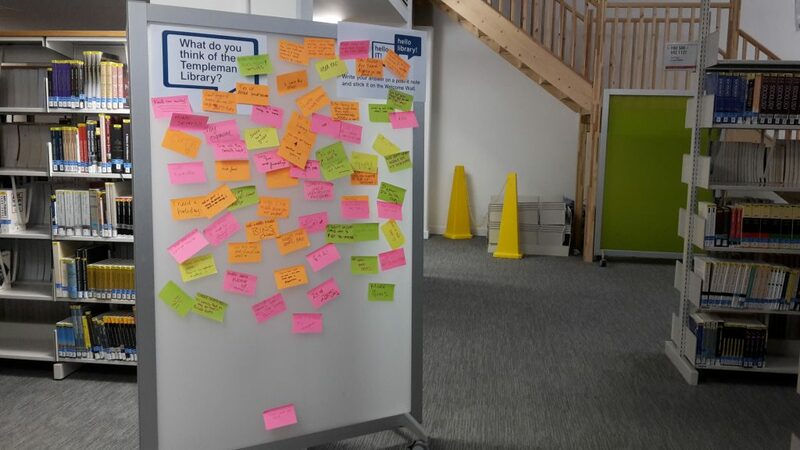 We chose to try a comments wall, having seen other libraries use it successfully as a way to get students’ honest feedback and have a conversation with them (such as York St John, Cambridge’s Judge Business School and Leeds Beckett). students’ thoughts on the Library. This was a secondary consideration, as we didn’t have a plan to pass on or act on feedback immediately. Most of the comments confirmed views we were already aware of. it was originally designed as an activity students could do while waiting for their next session. Floor 1 West, near the Library & IT Support Desk. First it was round the corner from the Support Desk, with the question ‘What do you think of Kent so far?’. Partway through the week it was moved within sight of the Support Desk, next to the printer, with the question ‘Tell us something you’ve learned today’. 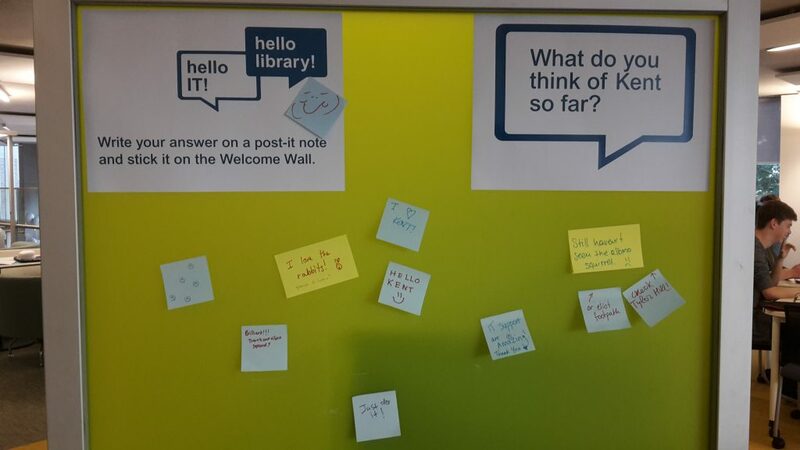 The wall in the Core Text Collection got a lot more responses – especially useful, relevant ones – than the one upstairs. was not close to or in sight of the Loan Desk – so students felt less self-conscious. It looks like students are happy to write on comment walls as long as they’re in the right place and ask the right questions, so it would be using them again. Next time it would be better to use a whiteboard if we have one available. It’s easier for staff to reply and it doesn’t use so many materials (just whiteboard markers – tied onto the board so they don’t disappear) or risk dropping post-its all over the floor. Lending Services are interested in having a whiteboard permanently in the Core Text Collection, and perhaps also in Templeman East, so watch this space.